When it comes to rare books and antiquities, Brooklyn Wainwright is a master. Which is why she's returned home to San Francisco to teach a bookbinding class at Bay Area Book Arts. Unfortunately, BABA director Layla Fontaine is a horrendous host who pitches fits and lords over her subordinates. With the help of her beau, British security officer Derek Stone, Brooklyn manages to put up a brave face and endure. Unfortunately, someone else is not so forgiving. Layla is found dead of a gunshot wound, and Brooklyn is bound and determined to investigate. But when Layla's past ends up intertwined with Derek's, Brooklyn realizes that the case is much more personal than she thoughtand that the killer might want to close the book on her for good. "The writing in this cozy is sophisticated, the career details new and fresh, the characters sympathetic, vivid and realistic and the mystery compelling. This is a cozy that even non-fans of the genre would enjoy." "Kate Carlisle weaves an intriguing tale with a fascinating peek into the behind-the-scenes world of rare books. Great fun, and educational too." 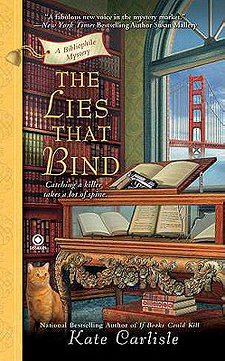 "When it comes to rare books and antiquities, Brooklyn Wainwright is a master...The Lies That Bind is full of sexual frustration, lies, manipulation, and murder; all the things that make a good mystery story. Brooklyn is a likable character with strong wits and a quick mind. Kate Carlisle is a strong writer who weaves an interesting tale that keeps the reader engaged until the very end." "I highly recommend this series to any book conservator...who enjoys encountering a cast of quirky characters and a heroine who just can't keep herself out of trouble."